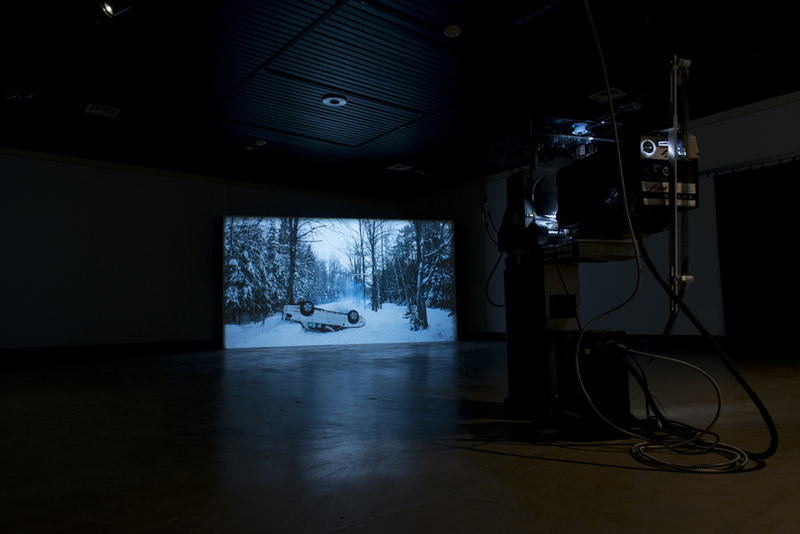 Off Route 2 is a 35mm film loop portraying the anticlimactic aftermath of a car crash accompanied by 2 flat screen monitors presenting details of the scene itself and of the film crew waiting patiently between takes. 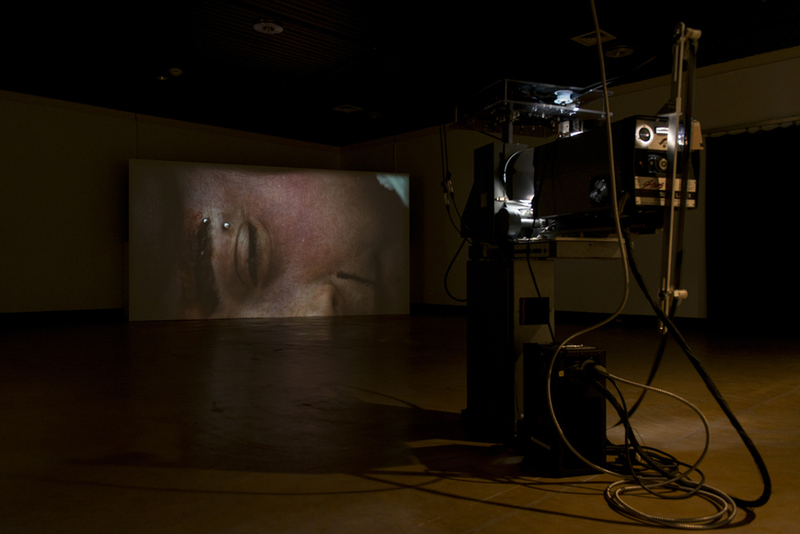 This installation seeks to subvert conventional cinematic portrayals of trauma and tragedy through focusing on moments rarely portrayed on screen while simultaneously revealing the artificial apparatus of cinematic construction. Twisted metal, flowing blood, and bone protruding from broken flesh serve as a mere backdrop to a deeper look at trauma and the often-anticlimactic aftermath of personal tragedy. It is in the peaceful quiet that follows a crash that the banal becomes beautiful and mundane monumental. As the woman hangs injured and suspended from her seatbelt in the upside down car, she observes beautiful wildlife in the landscape around her and her tragic situation seems at once disconnected from and yet interwoven with the surrounding beauty. This is as much a performance art work of endurance as it is a fictional construct. The execution of this film demanded that the artist (who uses her own body in all of her films) hang upside down for extended periods of time in sub-zero weather. In mainstream cinema, major tragic events such as this are often portrayed as climactic turning points in a story, yet in this instance, the bloody accident is the inciting incident, rather than the crisis or climax, and it has in fact already occurred off-screen before the cameras arrived. The emphasis of this film is on the events following the accident, when life seemingly continues as normal around the crash scene, the woman is conscious and waiting for time to pass in suspended animation. This car accident involves only one car, driven by only one passenger; the trauma is thus personal rather than a shared event. The event of the car accident was chosen for its blatant physical violence against the subject’s body, which stands as a metaphor for other invisible forms of personal violence such as psychological and emotional trauma related to any number of other personal tragedies such as medical illness, romantic break-ups, financial bankruptcy, and so on. 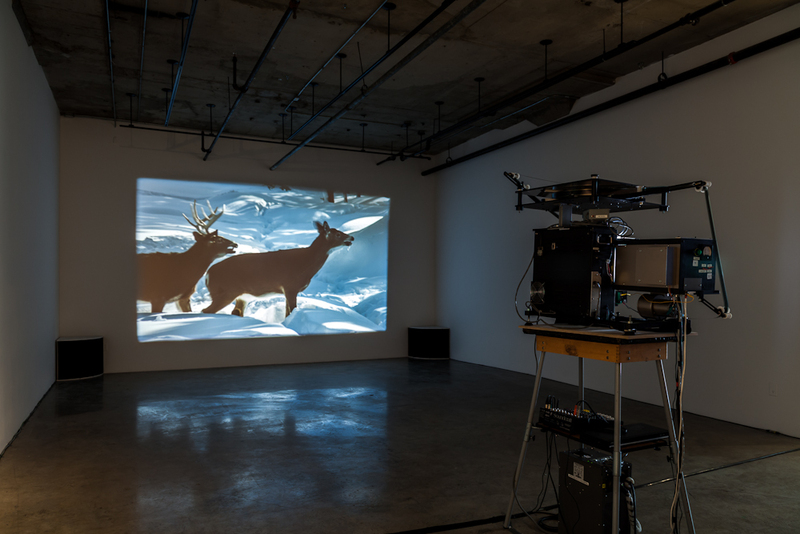 Wildlife such as deer and arctic wolves are present in the scene and serve to build a sense of peaceful tension. The woman hangs inverted in silence in the realm of the animals – there is no music playing on the car stereo and thus the animals have not been anthropomorphized or transported into her world. Instead, she finds herself inhabiting their space listening only to the pheasants, crows, deer breathe, wolf grunts, and the highway in the distance. The deer and the wolves look passively yet with interest at the scene, and the viewer wonders if the wolves will attack given the scent of blood from the woman’s injuries, and yet the wolves loose interest in the woman opt to chase the deer instead. In the second part of the film loop, we see firefighters enter the scene to rescue the woman. At first it appears as a classic stereotype of damsel in distress. But as the camera tracks backward, we gradually see the boom mic, the dolly track, the boom operator, the assistant director, and other members of the crew. The firefighters continue the extrication process using the jaws-of-life and the sound of crunching metal and gasps of fear (as recorded from inside the car) dominate the soundtrack. The scene is at once artificial (with the revelation of the film crew) and real (as the director/performer is actually strapped inside the car as they twist and cut the metal). Once she is safely removed, the viewer can hear the confusion lingering in her voice as the assistant director comes to discuss the next scene. All of a sudden it has become apparent that the “damsel in distress” is actually the “director in control” as she discusses the next shot and thanks the firefighters for their help on the scene. Once she yells cut, the image rolls out to black and the loop begins again with her strapped upside down in the car.